You can set up polls to hold elections and survey your membership. 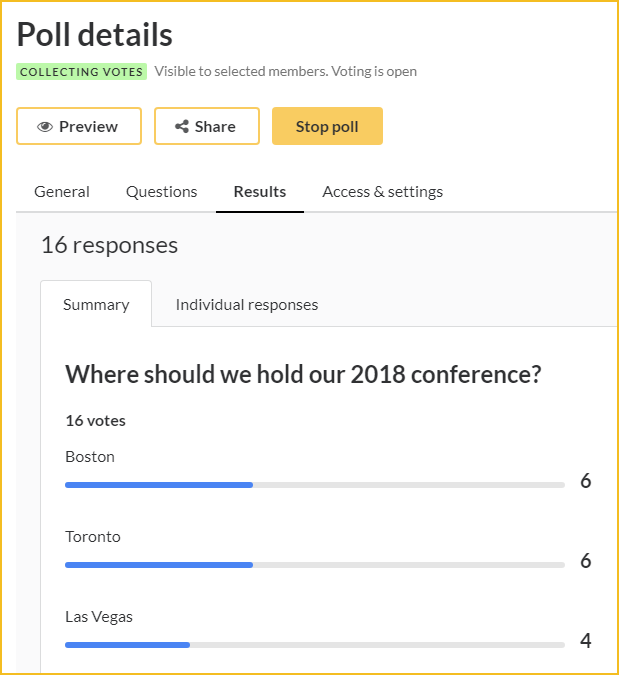 Your polls and surveys can be shared with your members by inserting links in emails or on your website, or by enabling the automatic poll announcement email option. Only full administrators can set up and publish polls, and view the results. Only members with a membership status of Active, Pending Renewal, or Pending Level Change can complete polls. To begin creating a poll, hover over the Members menu and select the Polls option. On the screen that appears, click the Create poll button. The Create poll screen that appears is divided into 3 tabs: General, Questions, and Access & settings. On the General tab, you enter the following details. The title of your poll. The poll title will be used to identify the poll to your members, and within admin view. The description of your poll. The description will be displayed to your members under the poll title. You can use the content editor toolbar to format your description text, insert files, and add images, links, and tables. The description is limited to 4,000 characters of HTML. On the Questions tab, you can add the questions you want to ask your members. The questions will appear to your members below the poll title and description. All poll questions are required/mandatory. When you create a poll, a blank question appears, ready for you to fill in the details. To add another question, click the Add question button below the last question. For each question, you can specify the following information. The question as it will appear to your members. Determines whether members can choose more than one answer or option. If the question type is Radio buttons, then members can choose only one answer or option. If the question type is Checkboxes, then members can choose multiple answers. When you set the question type to Checkboxes, you can specify the maximum number of answers or options. You cannot set the maximum number of options to exceed the number of options you have set up, so set up your options before specifying the maximum number of options. For each question, you can provide multiple options or answers. To get you started, two blank options are automatically created. To enter your option text, just click within the option and start typing. To add another option, click the Add option button after the last option. To reorder options, drag the icon that appears to the left of the option name up or down. If you want respondents to be able to suggest a different option, check the Allow suggestion/other field checkbox. In your poll, an Other option will appear below the options you have provided. Once a respondent clicks the Other option, a field will appear where they can enter their own choice (using to 256 characters). 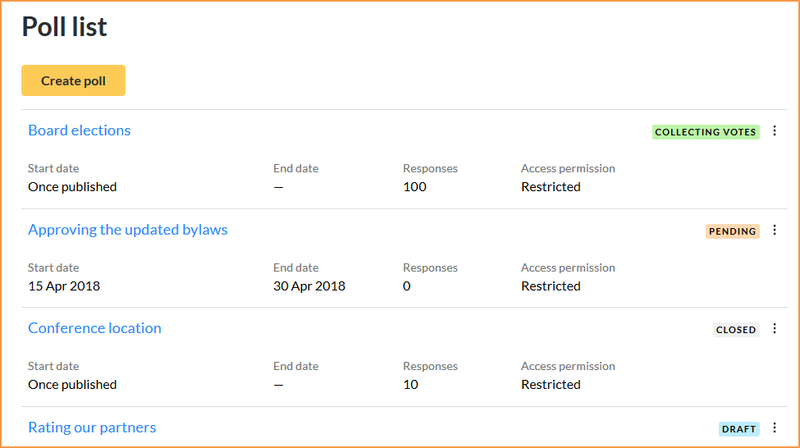 From the Access & settings tab, you can control when the poll becomes available to your members, and which types of members will be able to view and complete it. You can also enable an announcement email to be sent to authorized members. Under Availability, you control when the poll becomes available to your members. 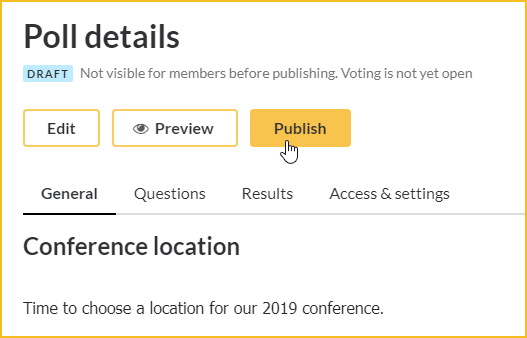 If you select Once published, then your poll will open for voting the moment you click the Publish button after saving your poll, and the status of your poll will change to Collecting votes. 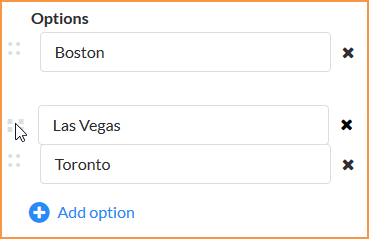 If you click the Set start/end date option, you can choose the start date and optionally, the end date of your poll. 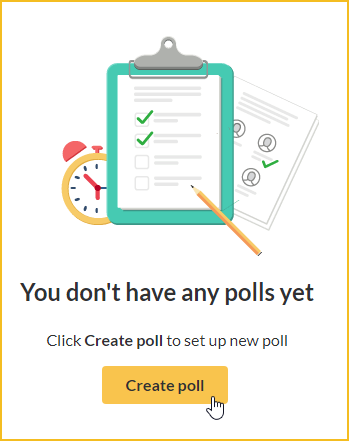 After you've published your poll, it will be visible to your members but cannot be completed until the very beginning of the day you specify (i.e. one second past midnight). If you specify an end date, the poll will automatically close at midnight at the beginning of that day, and its status will be automatically changed to Closed. You cannot specify the same start and end date. 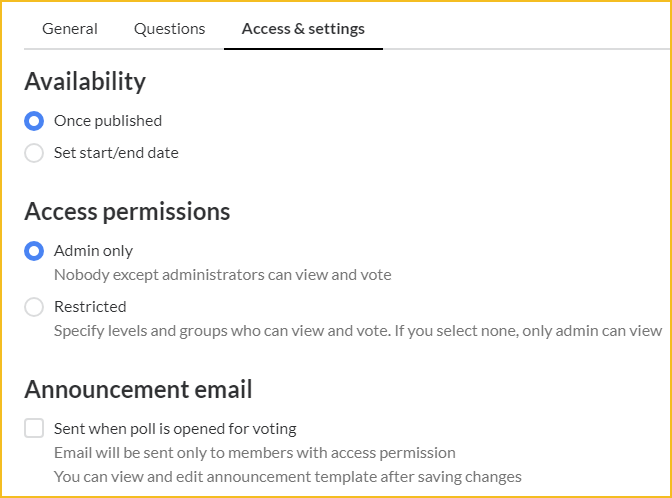 Under Access permissions, you control which types of members can view and complete the poll. If you choose Admin only, then no one except full administrators can view and complete the poll. If you click the Restricted option, you can choose the membership levels and member groups you want to restrict the poll to. 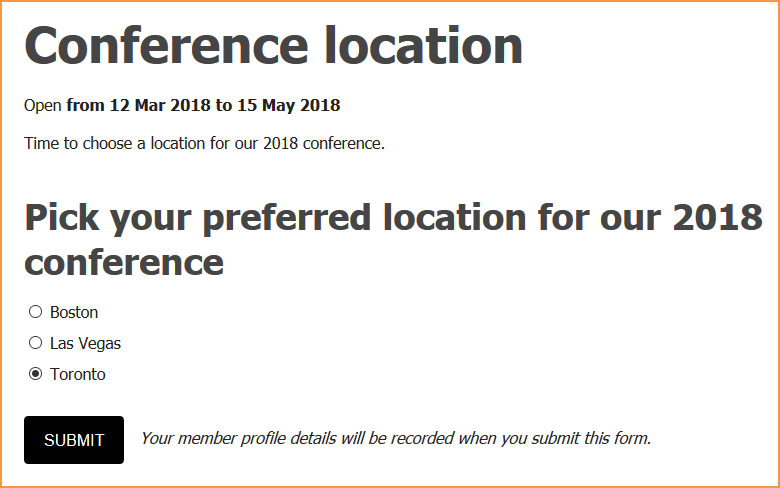 If you restrict access by both membership levels and member groups, then members who belong to any of the selected levels or groups will be able to view and complete the poll. If you check the All levels or All groups option then all levels or groups – including any levels or groups added in the future – will be selected. Only members with a membership status of Active, Pending Renewal, or Pending Level Change can view and complete polls. If you enable this option, an email announcement will be automatically sent to members who are allowed to view and complete the poll. The announcement will be sent once the poll is open for voting. To modify the announcement template, save your poll then return to the Access & settings tab and click the View/edit template link. Once you've saved your poll, you can preview it before publishing it. To view how your poll will appear, click the Preview option. 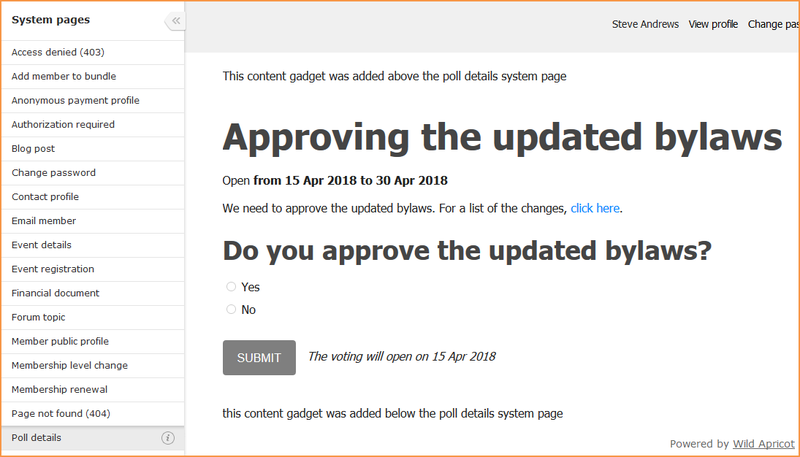 The poll will be loaded within the Poll details system page, which you can modify by adding content above or below the Poll details system gadget. 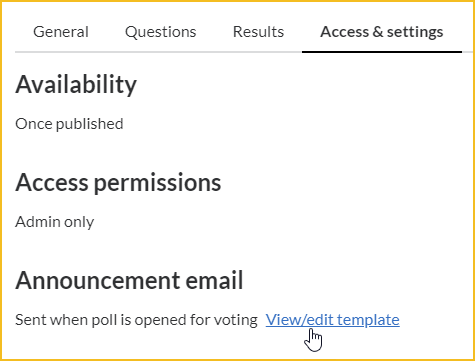 Once you're ready to share your poll with your members, open the poll and click the Publish button. 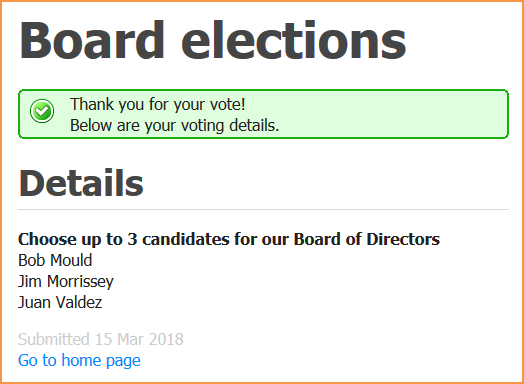 If you have set the availability of your poll to Once published or to a start date not in the future, the status of the poll will be set to Collecting votes, and members to whom you granted access can view and complete the poll immediately. If you set the availability of your poll to a date in the future, then the status of the poll will be set to Pending. Members to whom you have granted access will be able to view the poll but not complete it. 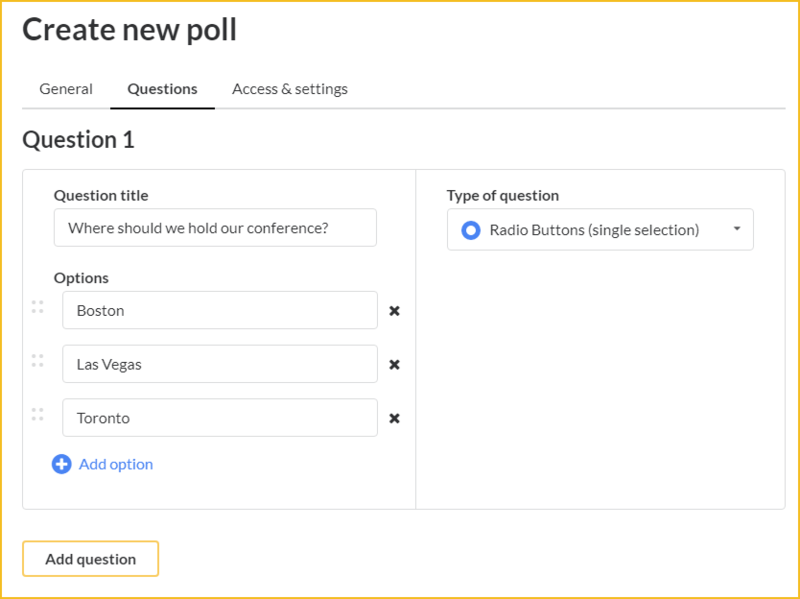 Once your poll is published, you can share a poll with your members by inserting a link to the poll in an email or on your website, or by enabling the automatic poll announcement email option. To copy a link to the poll, click the Share button. When your members click on the poll link, either within an email or a page on your site, they will be prompted to log in, if they are not already logged in. Once they are logged in, they will see your poll question(s). After choosing from the possible options, voters click the Submit button to complete the poll. After they click the Submit button, a summary of their vote(s) will be displayed. You can add content above and below these two screens by adding gadget above or below the Poll details gadget within the Poll details system page. Members can only vote once per poll. If a member clicks the poll link again after already completing the poll, their vote summary will be displayed again. Neither members nor administrators can change a vote after it is submitted. If you've set the end date for a poll, it will be automatically closed at the beginning of that day at midnight. Whether you've set the end date or not, you can manually close a poll by clicking the Stop poll button within the poll details. The status of the poll will be set to Closed. You can reopen a poll immediately after closing it by clicking the Reopen option that appears for a few seconds in the upper right corner. Within the poll list, you can view the status of your polls and the total number of responses. If a voter is allowed to choose multiple options, his or her votes still constitute a single response. To view the voting for a particular poll, click it within the list then click the Results tab. You can view the results for a poll that is still collecting votes or for one that is already closed to voting. On the Summary tab, the total votes for each option is displayed. To view how individual respondents voted, click the Individual responses tab. The ability to view individual responses is available only by request. To turn on this feature, send an email from a full account administrator with your account number to support@wildapricot.com. You can click the arrow buttons to scroll through the responses, which are displayed in the order they were submitted. You can modify polls for which voting has not yet begun – those with a status of Draft or Pending. You cannot modify polls that have already been opened for voting – those with a status of Collecting votes or Closed. To modify a poll with a status of Draft or Pending, click the Edit button within the poll details. You can duplicate any poll regardless of its status. When you duplicate a poll, all questions and settings get copied, and the status of the new poll is set to Draft. Responses do not get copied to the new poll. To duplicate a poll, click the menu beside the poll status within the poll list then click the Duplicate option. The word (copy) will be appended to the name of the poll to distinguish it from the original. To delete a poll, click the menu beside the poll status within the poll list then click the Delete option. You can delete any poll regardless of its status. You cannot restore a deleted poll. The poll has not yet been published, and is therefore not visible to members. The poll has been published, but its start date is still in the future. The poll is visible to members with the link but cannot yet be completed. The poll is open for voting. If enabled, the announcement email will be sent. The poll has been closed to voting. Do I need to charge taxes in my online store?